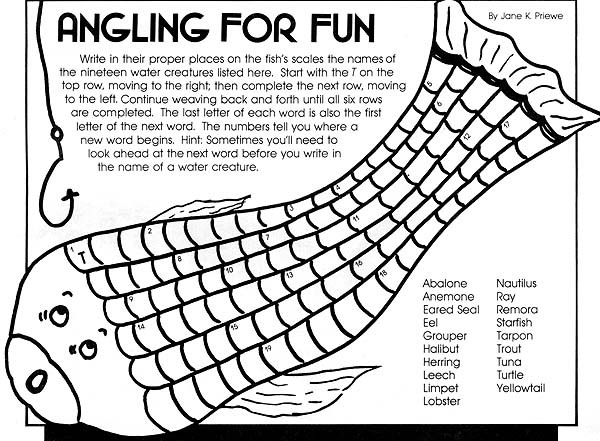 Write in their proper places on the fish’s scales the names of the nineteen water creatures listed here. Start with the T on the top row, moving to the right; then complete the next row, moving to the left. Continue weaving back and forth until all six rows are completed. The last letter of each word is also the first letter of the next word. The numbers tell you where a new word begins. Hint: Sometimes you’ll need to look ahead at the next word before you write in the name of a water creature. (1) tuna, (2) abalone or anemone, (3) eel, (4) lobster, (5) ray, (6) yellowtail, (7) leech, (8) halibut, (9) trout, (10) tarpon, (11) nautilus, (12) starfish, (13) herring, (14) grouper, (15) remora, (16) anemone or abalone, (17) eared seal, (18) limpet, (19) turtle.